The Larson Electronics MGL-480V-15KVA-240D.120V-30A temporary power distribution system converts three-phase 480V AC electrical current into 240D/120V three phase. This unit provides operators the ability to safely tap into and distribute 480V AC power from a variety of sources including generators and direct grid power. Portable Power Distribution Purpose and Use: The MGL-480V-15KVA-240D.120V-30A portable power distribution system gives operators the ability to power their equipment from a single system. On the primary side, operators connect three-phase 480V using a 20` #12 SOOW cable. 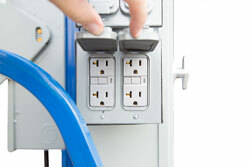 On the secondary side, operators are provided access to a NEMA 3R disconnect for customer loads and connections. Operation: A 20` #12 SOOW cable brings three-phase 480V power to the NEMA 3R 30-amp, 480V three phase primary disconnect, which contains three 25-amp time delay fuses, and passes 480V three phase power through to the transformer. 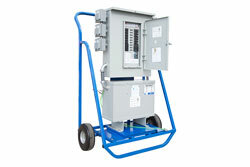 The NEMA 3R 15 KVA transformer converts 480V to 240D/120V three phase and passes the current to the secondary side. 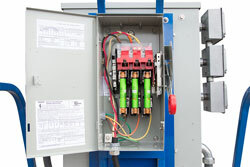 The secondary side of the transformer feeds a NEMA 3R 30-amp, 240D/120V three phase secondary disconnect, which contains three 30-amp time delay fuses. 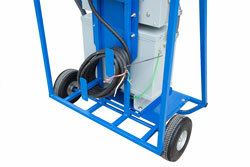 Protective Construction: The transformer and load center/distribution assembly is mounted to a powder coated steel, dolly cart style frame, resulting in an extremely stable, durable, and mobile power distribution platform. 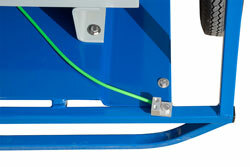 Two run-flat rubber tires and a dolly cart style mounting platform provides easier substation mobility, and a center point lift point allows easy lifting with cable or chain hooks.